Yesterday, I caught up with “The Perfect Storm”(2000) on the telly and this is a rehash of an old review of mine which I had written for a web portal. In 1991, a convergence of weather conditions - including Category Five Hurricane Grace and certain Canadian cold fronts – combined to form the most dangerous storm in recorded history. Sebastian Junger’s best-selling novel, “The Perfect Storm” is an account of the Andrea Gail ship and its fishing crew who sailed smack-bang into “the middle of the monster”. Director Wolfgang Peterson (“Airforce One”, “In The Line Of Fire”) is adept at crafting Hollywood blockbusters as well as stories involving men at sea (his 1981 submarine flick, “Das Boot”, is a cinematic masterpiece). “The Perfect Storm” is proof to this fact with thrilling sequences that give “Titanic” a run for its money and detailed displaying of the discipline of catching swordfish. If one knows nothing about the real-life chronicles of the Andrea Gail and wishes to remain oblivious before watching the movie, one is advised to stop reading more or be warned that there are spoliers ahead. Yes, “The Perfect Storm” hits the mark with its rip-snorting special effects, but fails to stir on a storyline level beyond its initial concept set-up. 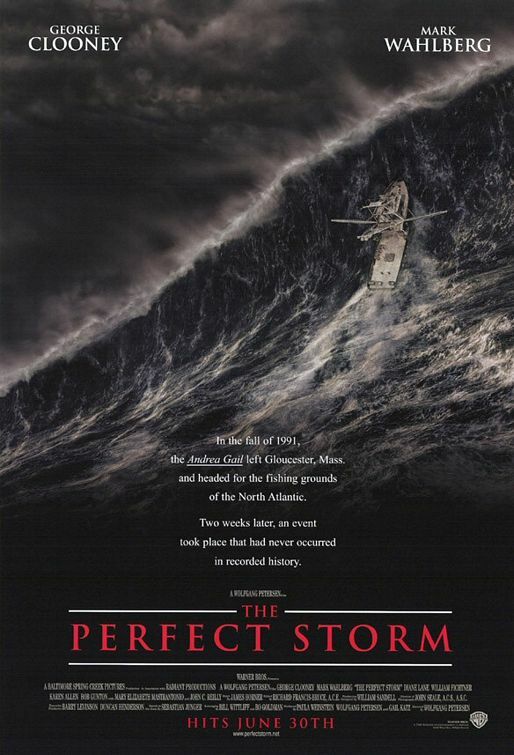 The problem with “The Perfect Storm” lies in the film’s script, most notably in the representation of all its main characters. Unlike “Titanic”, whose lead characters are clearly fictitious creations set against the backdrop of the most notorious recorded sea disaster in history, the Andrea Gail crew actually existed outside of the film frame. Skipper Billy Tyne (George Clooney),rookie Bobby Shatford (Mark Wahlberg), burly Dale Murphy (John C Reilly – “Magnolia”), prickly David Sullivan (William Fichtner – “Go”), happy-go-lucky Alfred Pierre (Allen Payne – “Jason’s Lyric”) and lonely Mike Moran (John Hawkes – “Blue Streak”) were all real, live people. That is, before they fell prey to nature’s wrath off the North Atlantic coast outside the fishing community of Gloucester, Massachusetts. When one realises that “The Perfect Storm” is pure assumption: that no one could know what transpired on the Andrea Gail that fateful Autumn, the crew’s climactic deaths take on a hollow tone. At the film’s end, all the sequences at sea involving this group of brave salts determined to return home fail to ring true. One may as well watch “Armageddon” for a similarly contrived tragic finale payoff. The five souls who lost their lives are reduced to a handful of Hollywood action caricatures. The only meaty parley comes when Clooney’s Billy Tyne poetically recounts to a fellow seafarer his joy of leaving port and setting sail onto the expansive ocean. But, even then, he has a pained expression on his face only half-hidden by Clooney’s trademark grin. It’s as if he’s thinking “Come on, let’s get to the action already!” Ultimately, “The Perfect Storm” could have showcased Bruce Willis, complete with hair extensions, on a surfboard and the outcome would have been equally as credible.